The Jets offensive line struggled throughout the game giving up multiple easy pressures. Thankfully for the Jets, both Sam Darnold and Teddy Bridgewater looked sharp when pressured, completing a high rate of their passes. Blial Powell showed why the other running backs are still going to struggle to take over his starting role. Despite him averaging just 2.8 yards per carry, he was being contacted at or behind the line of scrimmage early and often, working hard for any and all of his yards in the contest. The Jets’ pass-rush was generating pressures at will against the overmatched Washington offensive line. Henry Anderson was getting pressure up the middle seemingly early and often. It didn’t get home enough to make a difference in the outcome, but the unit looked good as a whole. Cornerback Rashard Robinson’s night ended with him giving up the 20-yard reception that ultimately resulted in the game-winning field goal by Washington, but outside of that play he was solid in coverage and better in the run game. Washington’s backup quarterbacks didn’t make any big mistakes and found some big plays to get the offense in position to put points on the board in their win on Thursday. Colt McCoy put the ball where it needed to be, while Kevin Hogan led the game-winning drive completed with a 20-yard back shoulder throw to set up the game-winning field goal. Outside of running back Samaje Perine’s 30-yard run, Martez Carter was the only one who could generate yards against the Jets defense. He forced two missed tackles and added a bunch of his 45 total yards after contact. Washington’s offensive line did them no favors by getting blown up off the snap by the Jets’ defensive linemen, who found themselves in the backfield often. New York: Both Henry Anderson and Xavier Cooper were the Jets best defensive players, especially in the run game, where they both made a stop and affected multiple plays against the run. Washington: Quarterbacks were the key for the Redskins. 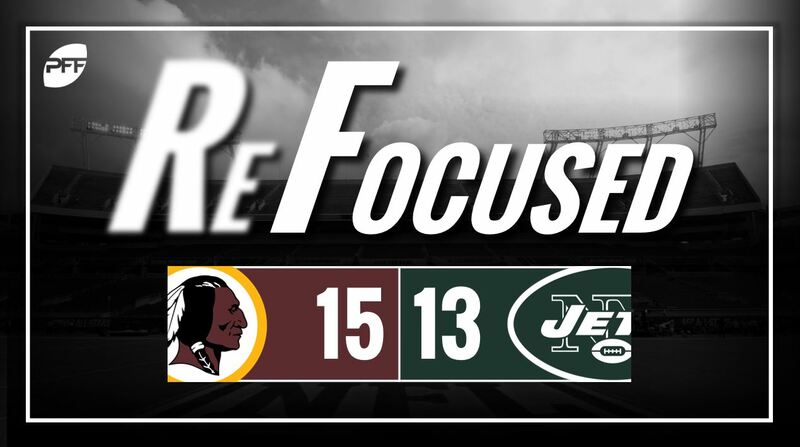 The duo of Colt McCoy and Kevin Hogan were able to make enough plays to win, while Cam Sims did his part by picking up three first downs on four receptions.